Here is where former members of Saskatoon Christian Centre can share their experiences, both positive and negative, with each other and with the public. For those posting, please be tasteful with what you write, or your posts will have to be removed. This is not designed to be an attack on any person or group of people. It is more about exposing a belief system and the culture that it produces. However, be honest and don't hesitate to share your persectives. We want everyone to be aware of the good, the bad, and the ugly in order to make an educated decision regarding their attendance. 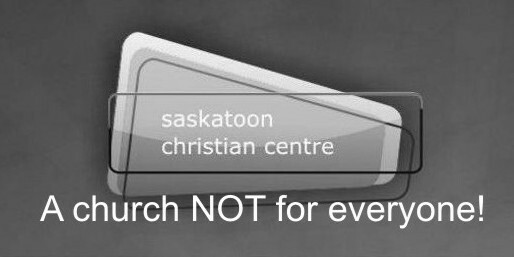 Here is where former members of Saskatoon Christian Centre can discuss their experiences and perspectives regarding SCC, both positive and negative, with each other and with the public. For those posting, please be tasteful with what you write, or your posts will have to be removed. This is not designed to be an attack on any person or group of people. It is more about exposing a belief system and the culture that it produces. However, be honest and don't hesitate to share your persectives. We want everyone to be aware of the good, the bad, and the ugly in order to make an educated decision regarding their attendance.